“Secrets of the Old Music Room” by Christy Wilburn Nobella Webb is a time-travel romance set in the late 1960s about Debra, a seventeen year old teenager who knows what she wants in life. Music is priority number one for Debra and she knows that if she works hard enough she will inherit her grandfather’s baby grand piano. Money is tight for Debra’s family, and it’s caused a bit of an insecurity problem for Debra. She often doesn’t think she is “good enough” when she compares herself to her peers. To earn a bit of spending money, Debra works at her grandfather’s house, watering the lawn and cleaning. One day while she was at her grandfather’s house she sneaks into the old music room, a place filled with happy memories for Debra and her family. She spots the old player piano and sits down to play. Suddenly a tune begins to play and actual musical notes begin swirling up from the piano. One of the notes takes the form of a person, named Middle C. Middle C takes Debra on a musical journey where she meets Ted, another music lover. Debra and Ted travel through time with a few other students, each chosen for special musical instruction. If these musical students do well in their studies, they will be rewarded by traveling farther through time to meet famous composers and music legends from times long ago. In the midst of all their musical instruction, Debra and Ted form a special bond. Will Debra do well in her musical studies and can she bring her new love back to the real world? I found this to be an enchanting novel about young love and the challenges facing impressionable young women. The characters are delightful, if a bit naïve, but are perfect in the context of the story. Readers will enjoy the flow of the fairy-tale-like plot, and the amusing and playful interactions between the characters. The author adds her own personal style and love of music by playing on the musical terms throughout the book. 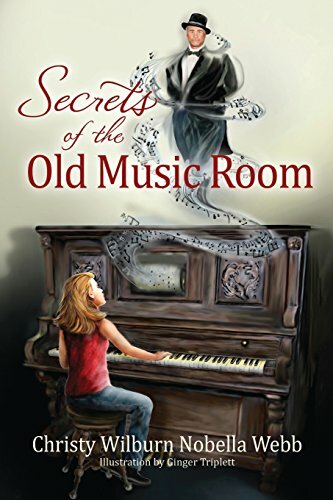 Overall, “Secrets of the Old Music Room” by Christy Wilburn Nobella Webb is an enjoyable coming of age romance that is suitable for all ages, but will most especially be enjoyed by teen-aged girls and music lovers.